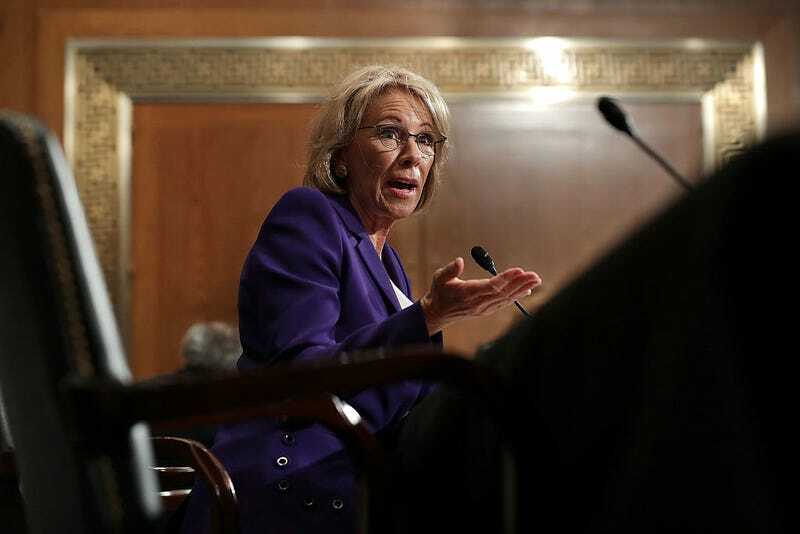 Betsy DeVos, the woman who has no connection to public schooling or experience running a multimillion-dollar anything, was confirmed by the Senate on Tuesday as U.S. education secretary. The vote went to a 50-50 split after two Republican senators—Susan Collins of Maine and Lisa Murkowski of Alaska—went against their party and voted with their heads to oppose the Michigan billionaire, who has spent the majority of her time in education pushing for privately run charter schools. Vice President Mike Pence broke the tie to confirm DeVos. According to the New York Times, this was the first time in history that the vice president was called to Congress to cast the deciding vote for a president’s Cabinet pick. While DeVos has absolutely no qualifications to hold the position and bombed during her confirmation hearing, she is a large donor to President Asshat’s campaign and is a personal friend of the president. She also believes that teachers should be allowed to carry guns in class in case a werewolf bear or something tries to attack them. There is no saving grace here; she is going to be tragic. And the worst part is that children are going to suffer. But she is rich and friends with the president—which is really all you need to run a major governmental agency in this administration.